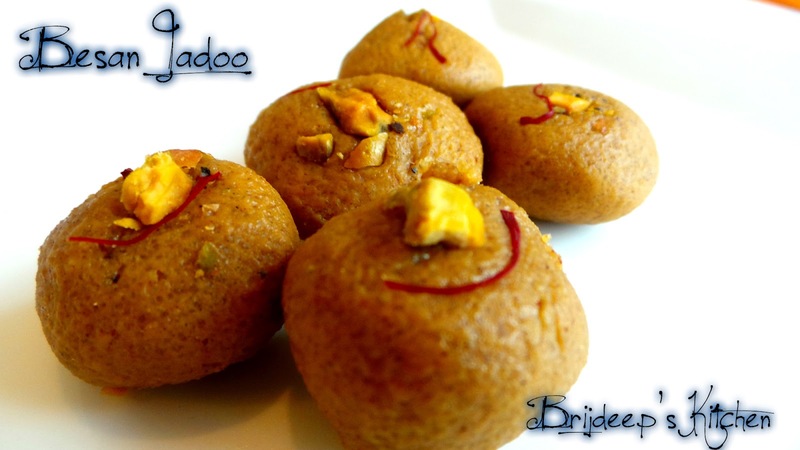 Besan laddoo doesn't need any introduction for most of Indians. 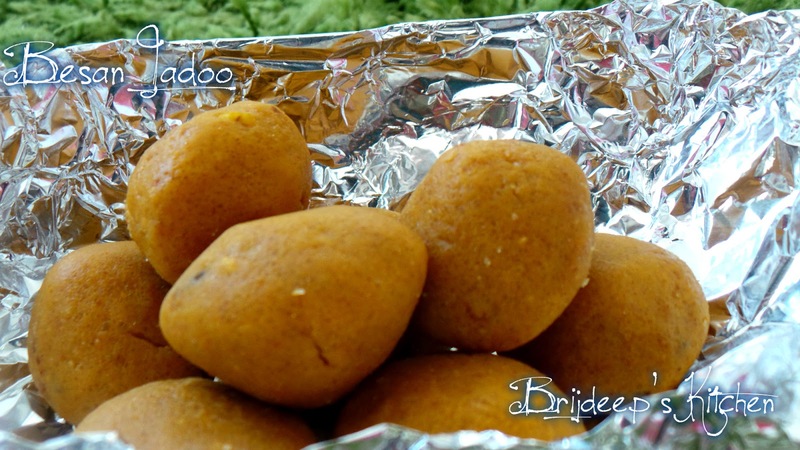 It's a popular sweet made of chickpea flour, sugar and ghee. Simple ingredients make up this lovely and perfect melt in the mouth sweet and I bet you can't just eat one at a time !! 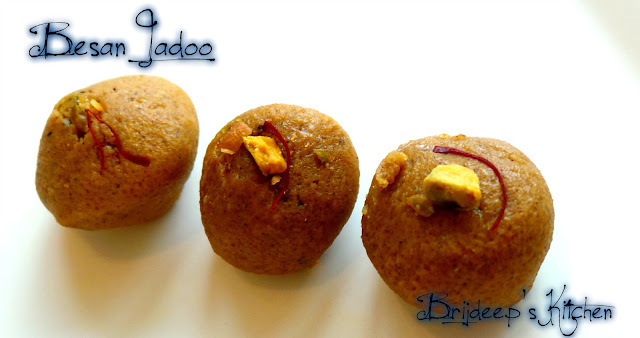 Laddoos are ball-shaped sweets popular in India and they are prepared for religious offerings in temples, for celebrating festivities in homes and even just like that a lot of times. Whenever there is a big festival in India, we miss home and the celebrations with pomp and show, weather or not we celebrate the festival at home. The least we can do in a foreign land is to try and have celebrations in our own little ways.. 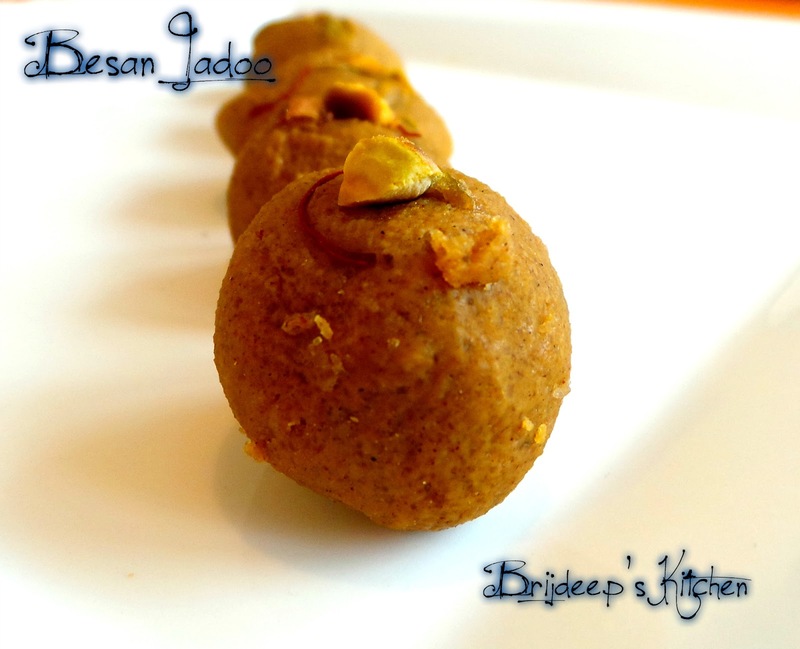 So just in time for the big Ganpati festival (Ganesh Chaturthi), I prepared these lovely, melt in the mouth besan laddoos. 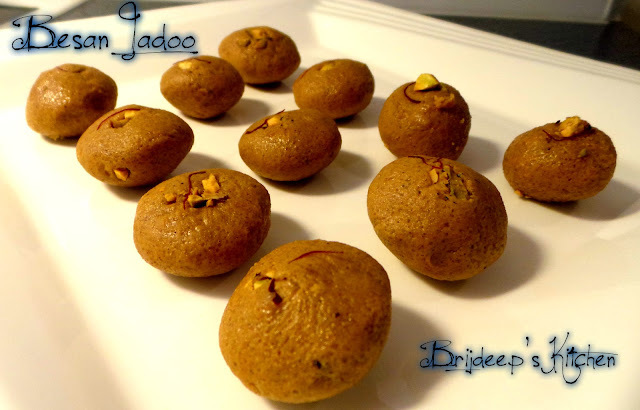 I also prepared mini bite-sized laddoos for potion control. 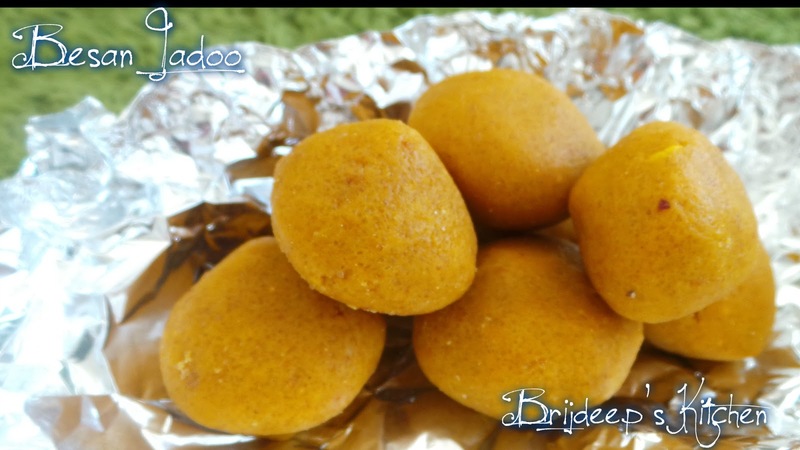 This is my Nani's recipe but we usually used to get them from sweet shops in India, while they are not so readily available here. Heat a deep-bottomed pan over medium heat and add the gram flour. Begin to dry roast the gram flour, stirring continuously so that the besan is roasted evenly and is not burnt. This will take about 10 minutes and after that you see the change in color of besan (it will start getting darker) and a lovely nutty aroma. At this stage the besan is done. Now immediately add the ghee and mix in the besan. The consistency should be such that it would be able to bind in shape. If it is of crumbling consistency, add little more ghee till it reaches the desired consistency. Don't add a lot of ghee at once but add very little at a time. Add the powdered sugar and mix everything well. Again keep stirring for few minutes until everything is mixed perfectly and a you feel the nutty aroma of the roasted ghee and besan. Add the crushed cardamom at this stage if adding. You can also add the chopped pistachios at this stage instead of cardamom. I added pistachios at this stage and did not decorate with anything at the top. For mini laddos, I have added cardamom at this stage and decorated with saffron and pistachios. There are so many ways to do this, so you can choose what you love. Turn off the flame and let it cool for few minutes so that it is warm to touch and shape but not too hot. Slowly make round balls with your palms and decorate with chopped pistachios, saffron or any other dried fruits you want. Besan laddos are ready !! Refrigerate for about an hour to let solidify. 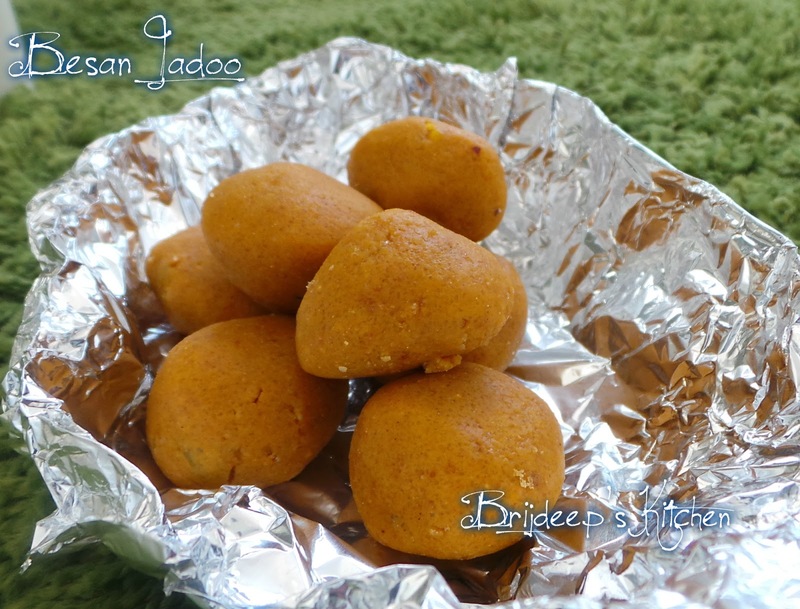 Take out and devour or offer as prasadam for the festival. (I'm not sure weather or not to refrigerate if using as offering to god because I have never celebrated this festival, please do confirm). 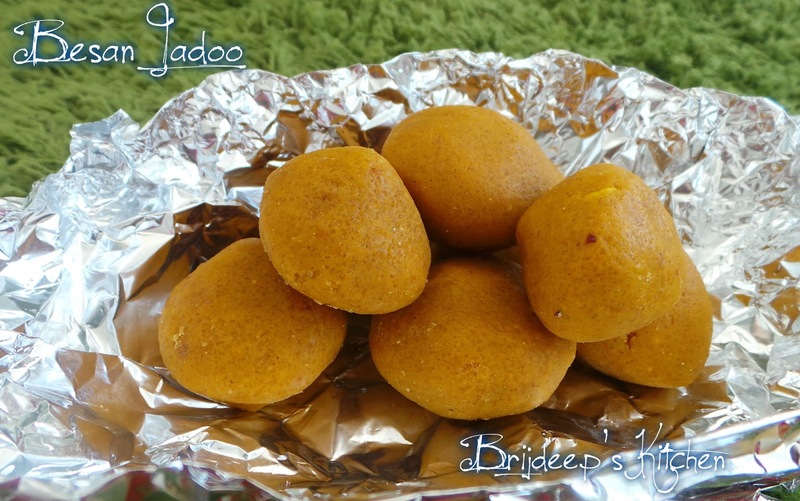 And here are the bite-sized laddoos I made for potion control, even though I'm sure of the fact that nobody can resist and eat just one !! Loved this recipe? Please do leave a comment and/or feedback because it really inspires me everyday. Don't forget to connect with me on my Facebook Page. Looking for more sweet recipes for the festivities? You might love this Instant Gulab Jamun, Strawberry Kaju Katli or the holy offering of Kadha Prasad.